Our live action documentary, Lion Ark, the story of the rescue of 25 lions from Bolivian circuses is creating awareness in a fresh, exciting and uplifting way. 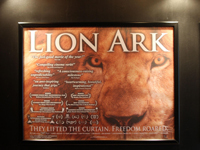 Following screenings across Bolivia last autumn, Lion Ark toured the UK cinemas before Christmas with a gala screening in London’s Leicester Square. With a full house enjoying a special ‘pilot’ screening at Everyman Walton-on-Thames in July, screenings at other Everyman locations are likely, along with a US theatrical tour in January. possible. Lion Ark is to be broadcast as far afield as Korea, China and Latin America.